Hiddush - Sukkot 2016: Batya Kahana Dror, Esq. Homepage / Hiddush News / Hiddush Positions / Sukkot 2016: Batya Kahana Dror, Esq. 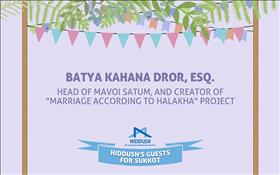 Head of Mavoi Satum & Creator of "Marriage According to Halakha"
Sukkot 2016: Batya Kahana Dror, Esq. Batya Kahana Dror, Esq. writes, "Getting married via the Rabbinate is not fitting for all couples. Sometimes this clashes with their worldviews, and sometimes it creates bureaucratic difficulties in simply obtaining the Rabbinate's permission to marry at all. Divorcing through the Rabbinate is also more difficult." During the days of Sukkot we exit our permanent homes and enter "temporary" homes; we are given the opportunity to understand what "home" means for us. For many of us, building a "home" begins at the moment when we decide to formalize our partnerships, an expression of love between two partners, the feeling of finding our "other halves" and aspiring to family life. Even the ways in which we get married is fundamental and significant for many of us, and expresses to a large extent our ways of life and our aspirations, how we relate to the private, the communal, and the national. In Israel, the monopolistic Chief Rabbinate's clear religious doctrine dictates which marriages of Jewish couples are officially recognized for purposes of the population registry. Getting married via the Rabbinate is not fitting for all couples. Sometimes this clashes with their worldviews, and sometimes it creates bureaucratic difficulties in simply obtaining the Rabbinate's permission to marry at all. Divorcing through the Rabbinate is also more difficult, not egalitarian, and involves serious injustices against women. The "Marriage According to Halakha" project we initiated through "Mavoi Satum" is designed to prevent and minimize such things, as well as to allow couples to have Jewish weddings according to Jewish religious law, which express the couples', Jewish, traditional, free spirits. The project is designed for couples who wish to get married according to traditional Jewish law, but without the Chief Rabbinate's involvement. The significance of such a step is that the wedding ceremony is valid according to Jewish religious law, but the married couples do not register their marriages with the Interior Ministry. The couple receives a certificate of "marriage according to halakha" from the rabbinical court, which makes it easier for them to be officially granted the status of "cohabitating," which is the ultimate alternative status to "married" in Israel, for there is no other way out. For the purpose of creating a private path to marriage, we worked cooperatively with rabbis who are willing to marry couples in private, as well as with an ultra-Orthodox rabbinical court in the neighborhood of Me'ah She'arim, headed by Rabbi Avraham Dov Levin who for many years headed the Jerusalem Religious Council's division on marriage. The first step for the couple seeking to marry privately is contacting the organization for legal advice and clarification, including a pre-marriage agreement, which is an essential part of this process. The pre-marriage agreement we recommend to couples includes specific conditions for their halakhic, traditional Jewish marriages. The conditions are a halakhic mechanism that strengthens women's defenses against becoming "agunot" or against their husbands not divorcing them, should they want to get divorced. This is both in case their husbands cannot or choose not to grant them a divorces. The rabbinical court headed by Rabbi Levin checks that each member of the couple is single, and issues a certificate to confirm this. After the wedding ceremony, the couple receives a certificate of "marriage according to halakha" from the rabbinical court, which makes it easier for them to be officially granted the status of "cohabitating," which is the ultimate alternative status to "married" in Israel, for there is no other way out. At the final stage, the organization will publish the names of the married couples on a designated website.